DA to Telangana VRAs: Enhancement of adhoc increase from Rs.100/- to Rs.200/- per month to the Village Revenue Assistants: Telangana VRAs Village Revenue Assistants Salaries hiked, VRAs Present Salaries, TS Increment to VRAs, Present VRA Salary: Hon'ble Chief Minister Sri K. Chandrashekar Rao has announced that salaries of Village Revenue Assistants who are working on hereditary basis will be hiked by 64.61 percent. The CM has decided to increase the salaries of the Village Revenue Assistants from the existing Rs. 6,500 per month to Rs. 10,500 and over and above this Rs. 200 per month as an increment for achieving the Telangana State. This will result in VRA getting Rs. 4,200 more salary per month. Since the hereditary VRA’s are living 24X7 in the villages and are available to the people in the village, the CM also announced double bed room houses for them in their own village. The hiked salaries will be paid to the VRAs from April 1. The CM also instructed officials concerned to issue orders to construct a double bed room house for the VRAs in their village. 1. G.O.Ms.No.1304, Revenue (VA) Dept., dated:15.07.2011. 2. From the Chief Commissioner of Land Administration, Hyderabad, Lr.No.Ser.III(2)/1351/2017, dt.31.10.2017. In the circumstances reported by the Chief Commissioner of Land Administration, Telangana, Hyderabad in the reference 2nd read above, after careful examination in the matter, Government hereby enhance the ‘ adhoc increase ’ to the VRAs from Rs.100/- to Rs.200/- per month w.e.f. 01.08.2018. 2. The Chief Commissioner of Land Administration, Telangana, Hyderabad shall take necessary action accordingly in the matter. 3. This orders issues with the concurrence of the Finance (EBS.VII) Department vide their U.O.No. 4837/215/EBS.VII/Rev/2018, dated: 07.08.2018. 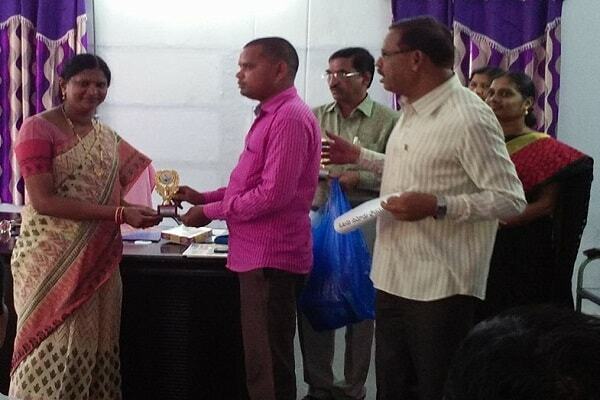 Revenue Department – Village Administration – Village Revenue Assistants – Enhancement of honorarium from Rs.6,000/- P.M. to Rs.10,500/- P.M and providing Rs.200/- as Telangana increment to the Village Revenue Assistants – Orders – Issued. 1. G.O.Ms.No.17 Revenue (VA) Department dated 21.1.2014. 2. Representations from various Service Associations. 3. Govt. Memo No.6918/Ser.II(2)/2015-1 dated 20.4.2015. 6. From the Prl.Secy to Govt (Political) GAD, D.O. letter No.325/Spl.D/2016-1, dated 14.10.2016. 10. Govt. Memo No.4631/Ser.II(2)/2017 dated 03.3.2017. In the G.O.1st read above Government enhanced the honorarium of the Village Revenue Assistants from Rs.3,000/- to Rs.6,000/- per month duly merging the D.A. portion of Rs.500/-w.e.f 1st February 2014. The DA portion was Rs.100/- at the end of December, 2013. 2. In the reference 2nd read above, certain service associations have requested for enhancement of the honorarium to the VRAs due to raising prices of essential commodities and other necessities. 3. In the references 8th & 11th read above, the Chief Commissioner of Land Administration & Spl.Chief Secretary, Telangana State, Hyderabad has submitted the proposals in the matter to Government to issue necessary orders in the matter. 4. Government, after careful examination of the matter, hereby order that the honorarium of the Village Revenue Assistants be enhanced from Rs.6,000/-P.M. to Rs.10,500/- P.M. duly merging the DA portion and also providing Rs.200/- P.M. as Telangana increment to the Village Revenue Assistants w.e.f 01.04.2017. The D.A portion shall be Rs.200/- at the end of December,2016. 6. The Chief Commissioner of Land Administration, Telangana State, Hyderabad/All the District Collectors shall take necessary action accordingly in the matter. The CM also announced 30 percent reservations for the VRA’s in the VRO, Attender and Driver posts. The CM also issued instructions that all those who are referred to and called as Vetti and other nomenclature should be referred to and addressed as the VRA. The decisions taken by the CM will help and benefit 19,345 VRAs working in the State. Hon'ble CM has also decided to regularise the VRAs who passed the Public Service Commission examination and working. The CM has asked TSPSC Chairman Prof. Ghanta Chakrapani and Special Chief Secretary (Revenue) Sri MG. Gopal to prepare guidelines on the matter. This decision will benefit 2,900 VRAS who were appointed directly after clearing the TSPSC but were working on a lesser wages. The Chief Minister held a meeting with the two categories of the VRA representatives who earlier had several meetings with Minister Sri KT Rama Rao. The meeting is held at Pragathi Bhavan here on Friday in which Deputy CM Sri Mohamood Ali, Ministers Sri KT Rama Rao, Sri Indrakaran Reddy, Sri Chandulal, TSPSC Chairman Prof. Ghanta Chakrapani, Government Whip Sri Palla Rajeshwar Reddy, MLA Sri Jalagam Venkata Rao, Special Chief Secretary (Revenue) Sri MG. Gopal, CCLA Secretary Sri Kalicharan and others participated. VRAs (Direct recruits) Association President Sri Vinjamuri Eswar, General Secretary Sri Ambala Sridhar, Mahila Wing President MS Balamani, VRA (Dependents) Association president, Secretary Sri Yellanna, Sri Rajaiah, trade Union leaders Sri G. Rambabu Yadav, Sri P. Narayana and others held discussions with the CM. “In the Telangana movement and later formation Telangana state, VRAs did a yeoman service. They are participating in every government programme and are available in the village 24 hours. All those who are working as VRAs are poor and are from the BC, SC, ST and Minority communities. Though it is called a part time job, VRAs are doing overtime. Despite all their workload they are getting meagre wages. They are not even getting the minimum wages. It is difficult to survive with Rs. 6,500 per month. There is a need to increase their salaries. Though it is a burden on the state’s ex-chequer we have decided to hike the salary of VRA to Rs. 10,500 per month plus Rs. 200 increment for obtaining the Telangana Statehood. This is recognition of their services and their availability round the clock in the village. This hike is 64.61 percent and hiked salaries will be paid from April 1. Every month on 1st like every other government employees VRAs also get their salaries. Besides hike in their salaries, the VRAs should be treated with dignity and respect. For ages their families are in the service of villages. Their self-respect is undermined as they were called by different names such as Vetti, Maskur, Kavalkar, Khaandhar etc., Stop addressing them with these names. Henceforth, they should be called as VRAs. All those working as VRAs as a family profession have been discharging their duties in the village only through out their service. In recognition to their service to the people in the village, the government will construct a double bed room house for them in their native village. Issue orders giving double bed room houses for all the VRAs working on hereditary basis. Start construction of the houses. With increased salaries, change in their designation nomenclature and the double bed room house should enhance the self-respect and prestige of the VRAs. And this is our government’s aim. For the appointment of VROs, Attenders and drivers appoint those qualified VRAs and 30 percent of reservation is given to them in these posts,” the CM clarified. “There are other categories of VRAs who are directly recruited by the TSPSC and they are working on meagre salaries. Due to new districts, mandals and Divisions there are more posts. Find out the vacancies and regularise the direct recruitees. Guidelines should be prepared on the issue,” the CM said. Tags: Telangana VRAs salaries enhanced, TS Village Revenue Assistants Salaries hiked,TS VRAs Present Salary, TS Increment to VRAs,Telangana Increment salary.